The capital of Macon county was named in honor of Stephen Decatur, so famous in the naval annals of our country, a native of Maryland, born in 1779. On the 22d of March, 1820, this gallant, noble-hearted gentleman fell mortally wounded in a duel with Commodore Barron, at Blandensburg. The land on which the original town of Decatur was laid out, was entered by Parmeans Smallwood, Easton Whitten and Charles Prentice, for which, at the time, they had not yet received a patent from the government. The commissioners appointed to select a site for the seat of justice were John Fleming, Jesse Rhodes and Easton Whitten. Mr. Whitten received ten dollars for his services, and the other members seven dollars and fifty cents each. Benjamin R. Austin, the county surveyor, laid off the town in accordance with instructions, "after the form of Shelbyville," and for his services was allowed the sum of twenty-four dollars. On the 20th day of June, 1829, Messrs. Smallwood, Whitten and Prentice entered into bond with the county commissioners, stipulating that, after they received their patent, they would convey to the commissioner a gift deed for the twenty acres of land on which the town had been located. "Ordered, That a sale of lots take place in the town of Decatur, in this county, on the 10th day of July next, on the following terms, to-wit: a credit of twelve months will be given, and note with approved security will be required, and that the clerk of this court is required to advertise the sale in the paper printed in Vandalia until the day of sale." At the sale on the 10th day of July, the first lot sold was No. 2, in block 3, where Priest's Hotel now stands, which being a corner lot, was bid in by John Manly for $53.50. The second lot was lot 6, in block 1, which was bid in for $12.00. At the time Decatur was laid off, one cabin stood on the twenty acres composing the town site; but several more had been erected as early as 1824 and '25, on land included within the present limits of the city. The first store in Decatur stood on the site of the Priest House, and was kept by James Renshaw, who came from Shelbyville, and who has descendants in the county. The second merchant was Isaac C. Pugh, prominent in the history of the county and state, who came from Vandalia. These stores were established in 1829, and the goods were carted from St. Louis. Decatur grew but slowly in the first years of its history, and in fact was little more than a hamlet, until 1836, when the state inaugurated the famous system of "Internal Improvements." Decatur was to be the crossing of the "Northern Cross" and Central railroads, and work was actually begun on both of these. Its growth from this year until 1842 was more rapid, and the population reached at least five hundred souls. In 1836 and '37 the spirit of speculation was rife. Town lots sold at fancy prices and additions were laid out. In 1842 all hopes of getting a railroad died out; and the burning of the steam-mill was a great blow to the properity of the place. From 1842 to 1852, when work was beginning on the Illinois Central R.R., it was at a stand-still. But from that time forward its growth has been continous and substantial. 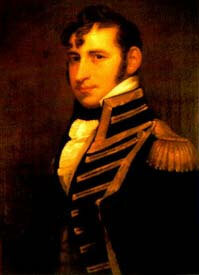 *Painting of Stephen Decatur is in the public domain. NAME RES. OCCUPATION NATIVITY SETT. ANDREWS, Thomas Decatur Saloon & Billiard Parlor ? ? ST. CLAIR, Demaras Sec 16 Wife of Willis Johnson Botet. VA .
STARR, J.G. Decatur Saddlery, Harn. & Leather . .